Which is why the new kids nasal flu spray is such an amazing invention! Just a quick spurt up their nose and they are covered for the potentially severe effects of catching flu (influenza). Just like the adult flu injection, it can’t give a ‘mini dose’ of flu. There are very few side effects, maybe just a runny nose for a day or two (but isn’t that just like every other winter day I hear you say!). 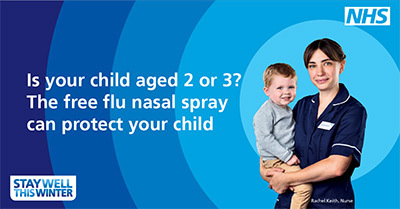 You will probably have had a letter from the School Nurse about the spray vaccine and we are encouraging all our patients with children to take part. It’s for children aged two and three plus school years 1 to 4. The programme will be extended in future years to include children of all ages. Home educators won’t miss out as they can contact the Practice Nurse to arrange a ‘spray day’! You may be surprised to learn that children are at particular risk of flu, and if they have any respiratory or immune system problems the effects of a nasty flu bag can be severe. Contact the surgery if you have any questions.